Fully satisfied RV owners with RV experience and customer satisfaction that is up to or beyond their expectations is the goal of Forest River, Inc.
With production capacity of a wide range and huge volume of products, Forest River, Inc. is able to fulfill its customers' orders promptly without cutting corners or rushing through production procedures. Whether it is RV, buses, pontoons park models or cargo trailers, each product undergoes an iterative design process with standard specifications being met and adhered to rigorously. 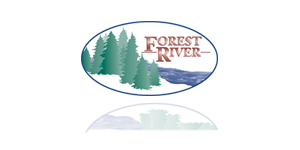 This ensures that each Forest River, Inc., product is conscientiously built so that every product safely and consistently meets the customers’ needs. 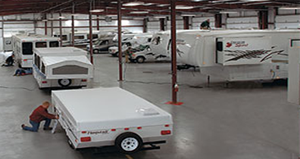 Our recreational vehicles go through a detailed inspection before they are shipped to the customer. This systematic Quality Test takes place in a Pre-Delivery Inspection (PDI), a state-of-the-art facility that gives immediate daily feedback to production for quality assurance of every unit manufactured. Housed in an aesthetically pleasing 20,000 square foot complex, the test facility blends many of the old tried-and-true methods of testing diverse types of our RV’s with new innovative ways of solving quality issues. All incoming units are appraised for quality of electrical systems, fresh water, holding tanks and numerous other mechanical or visual criteria as they journey down the PDI aisles.